The Rhodesian Ridgeback, once known as the African Lion Hound, was developed in South Africa by Boer farmers. The farmers needed a versatile hunting dog who could withstand the extreme temperatures and terrain of the bush, survive when water rations were low, protect property, and be a companion to the entire family. They started by crossing dogs they'd brought from Europe - such as Great Danes, Mastiffs, Greyhounds, and Bloodhounds - with a half-wild native dog kept by the Khoikhoi, a pastoral people. This dog had a distinctive ridge of hair along its back, and breeders noticed that crosses who had this ridge tended to be excellent hunters. At first, the Boers primarily used the dogs to flush partridge or bring down a wounded buck. When big-game hunting became popular, they found that the dogs were well suited for accompanying them when they hunted lions from horseback. The dogs would hold the lion at bay until the hunters arrived. A hunter named Cornelius von Rooyen began a breeding program in what was then known as Rhodesia (now Zimbabwe). A breed standard - a written description of what the breed should look and act like - was set down in 1922, and it's changed little since then. In 1924, the Rhodesian Ridgeback was officially accepted by the South African Kennel Union. 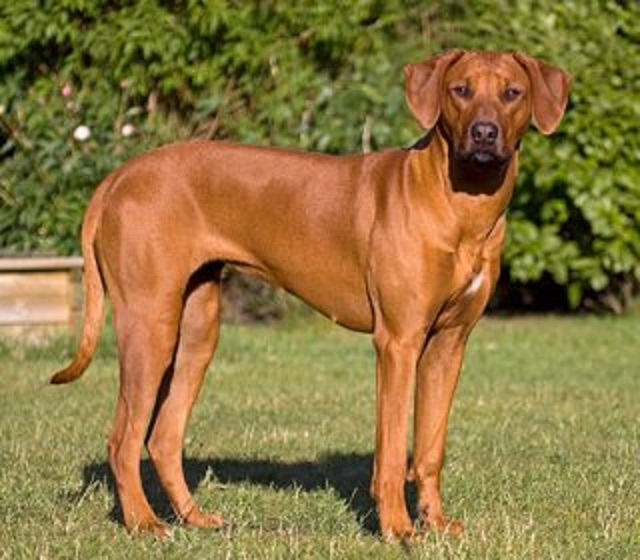 Some Rhodesian Ridgebacks may have made it to the United States as early as 1911, but it wasn't until after World War II that large numbers were imported to the U.S., Britain, and Canada. The first Rhodesian Ridgeback registered by the American Kennel Club (AKC) was Tchaika of Redhouse, in 1955. The AKC recognized the breed that same year. Today, the Rhodesian Ridgeback ranks 54th in popularity among the 155 breeds and varieties recognized by the AKC. The Ridgeback is quite popular in South Africa, where he first began his journey as a breed.